We offer many styles of awnings for your patio and exterior windows. Both can be retractable either manually or with optional motorized operation. Stay cool and enjoy your patio or deck on hot summer days. We offer a wide range of patio shading options to make your outdoor lving more comfortable. We also offer several styles of retractable window awnings. Window awnings can really dress-up a home and help you save energy as well. 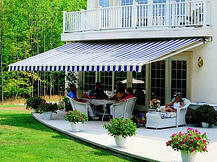 We have several styels of retractable patio awnings to meet the demands of the California market. We offer motorization and a variety of options, including our retractable solar screen valance for west-facing patios. Expand your home beyond interior walls and make your deck or patio usable on the hottest summer days. Retractable awnings protect you and your home from the sun's harmful rays. Bay Screens and Shades offers all available motor control options, wall switch options, remote control options, automatic control options or building automation systems. Motorization systems can be linked to any home control system, including Homeworks®, Crestron® and more. 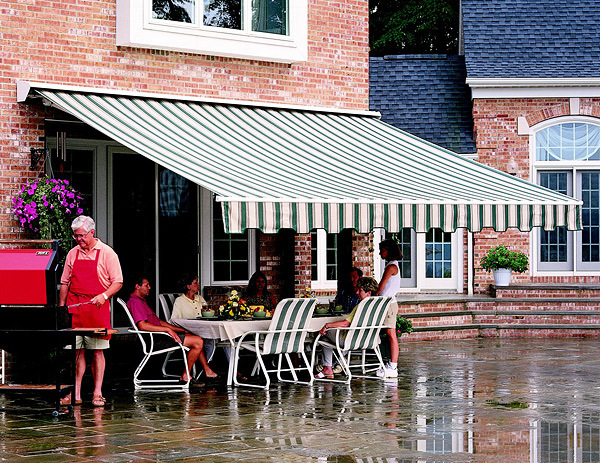 Click here for more information about motorized awning systems.